The Lucky Koi Slot represents one of my favorites from Microgaming software. From the exotic Asian-style graphics of Koi Fish swimming by to the different bonus games, this has got to be one of my new favorites. The game contains not one, but two bonus rounds. During the Koi Bonus Feature, you can choose among different Koi fish to reveal numbers that ad to payline wins. 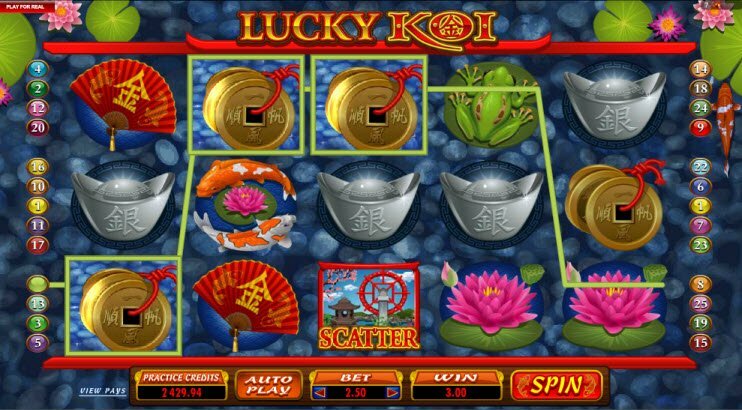 Microgaming software’s Lucky Koi Slot Machine offers a beautifully designed Oriental-themed Video Slot that also has rewarding Bonus Features. The animations during the game include rippling waters, swimming Koi fish, and enchanted lotus blossoms. In addition, the game contains a Bonus Choice game that awards multipliers as well as a Koi Fish Bonus that awards the sum of all picks times the total bet. Sit by a goldfish pond with the Lucky Koi Slot Machine. 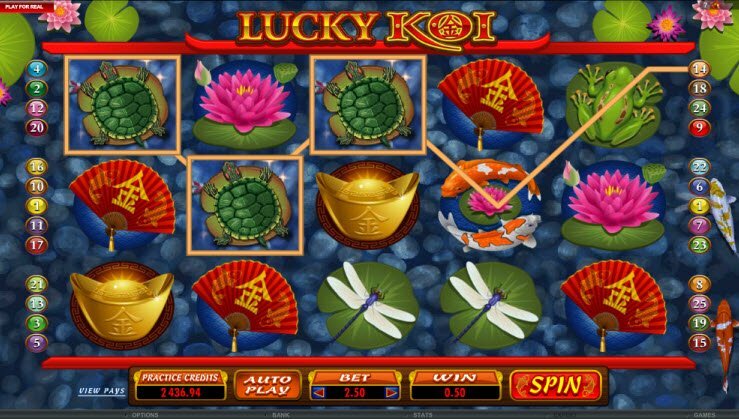 The reels of this well-crafted Microgaming Slot resembles a pond filled with multi-colored Koi fish, water lilies, lotus flowers, turtles, dragonflies, and little green frogs. During winning combinations, the images come to life and animate, adding to the excitement of receiving payouts. The rippling water seems lifelike with fish swimming by while you play. This Video Slot definitely has an Asian mystique with images and music from the exotic Orient. The enchanting Far East theme paired with quality graphics make this game a stand out from the rest. 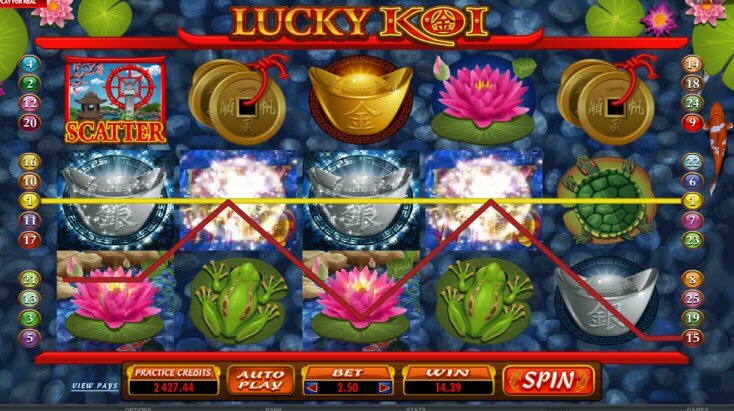 The reels of this well-crafted Microgaming Slot resembles a pond filled with multi-colored Koi fish, water lilies, lotus flowers, turtles, dragonflies, and little green frogs. The Scatter symbol triggers the Lucky Koi Slot Bonus Choice game where players have the chance to wine between 10-30 Free Spins with up to 5X Multiplier. 3, 4, or 5 Scatters will activate this Bonus Choice round, and players have the chance to retrigger the feature thereafter. During the Koi Bonus Feature, players choose 4 different Koi fish to reveal prizes. The chosen number awards the sum of all picks times the total bet. Bonus wins are then added to payline wins. In addition, this game gives the opportunity for players to receive a 125,000 jackpot.